Hitchhiking or ‘hacer dedo’ (doing the thumb) as they say in Spanish was our favourite means to get from one place to another in Patagonia. It saved us a lot of money and we got to know some lovely people. But it also brought us to the limits of our patience. 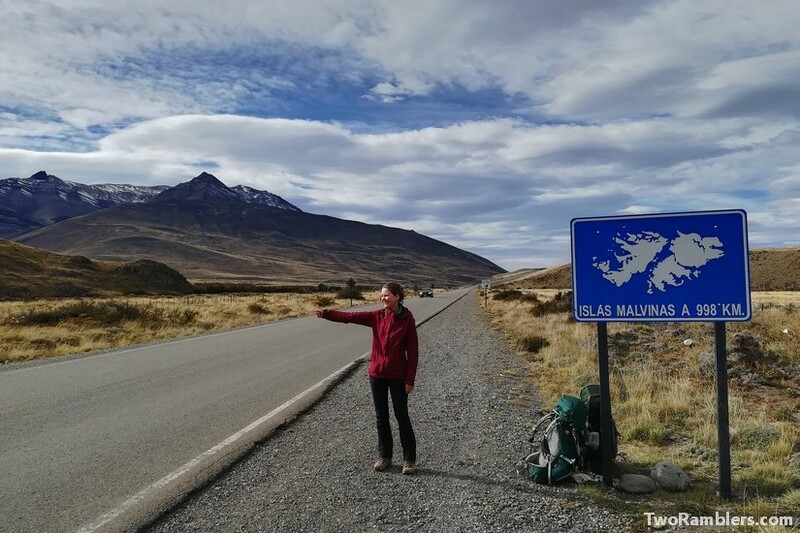 Hitchhiking is rather common among local and international tourists in Patagonia. We heard that during high season (December to February) travellers are queuing to get a ride. And with many tourists driving from one must-see spot to the next it is easy to be picked up. 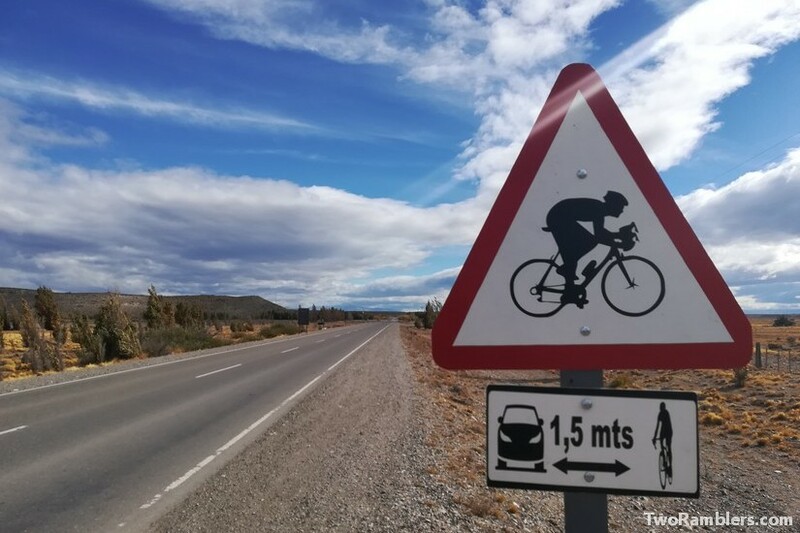 However, distances between towns can be quite large and especially on the Argentinian side, on the Ruta 40, traffic can be low. 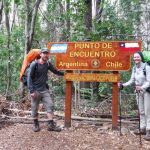 From Punta Arenas, in the very south of Chile we hitchhiked our way to Torres del Paine, over the border to Argentina in order to visit El Calafate and El Chalten. Our journey continued always going north on the search for hikes and good trekking weather. 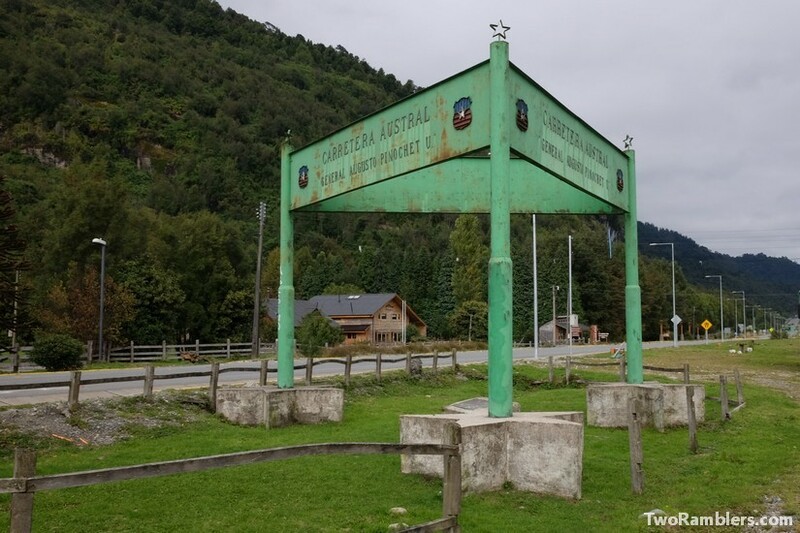 We crossed the border between Chile and Argentina four times. It was not always easy to find a ride and a few times we chose the comfort and predictability of a bus ride. However, we were able to make quite some distance by just sticking out our thumb. In total, over the course of 40 days, we travelled more than 2,300 km by hitchhiking. Below you can find some of the stories of this adventure, about the kind people we met, the successes and bad luck we had. We are endlessly grateful to all the people who stopped for us and took us along, inviting us into their cars and a little bit into their lives. Thank you all! 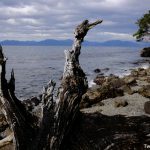 Our first attempts of hitchhiking in the south of Chile and the first border crossing to Argentina had been a success. 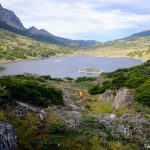 We never had to wait for more than half an hour on our route from Punta Arenas to El Chalten until a car stopped for us. So our hopes were high when we got ready to leave El Chalten in the direction of El Bolson where we wanted to do some more hikes. We left our hostel in El Chalten rather late in the day. 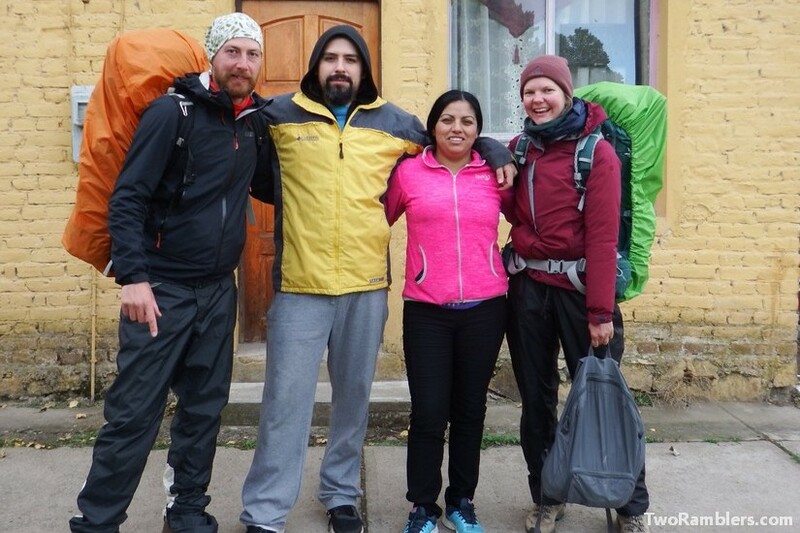 It had taken us a while that morning to come to terms with the fact that the weather and our timing was just too bad to cross the border to Chile. Our initial plan had been to do a three day hike to Villa O’Higgins. In the end, we decided to search for warmer days further north in Argentina. It was a sunny day but the cold Patagonian wind was blowing hard. As we walked towards the main road to leave the city we met some other hitchhikers, a French couple. They were going the same way as we but stood at a rather bad spot, at a difficult junction and in front of a police control. So we walked a bit further out of town and waited opposite a gas station. There were not many cars passing by and we got a bit worried that it could get difficult but after a bit more than half an hour a car stopped. Inside were three lovely women, a mother, her grown up daughter and a friend. They were going south but took us along on the 90km to the national road Ruta 40 from where we could try to find a ride north. We had just gotten into the car when we were already asked about our travels, our work, our families. We did our best to reply in our broken Spanish and we learned so much about our driver and her mother and friend. 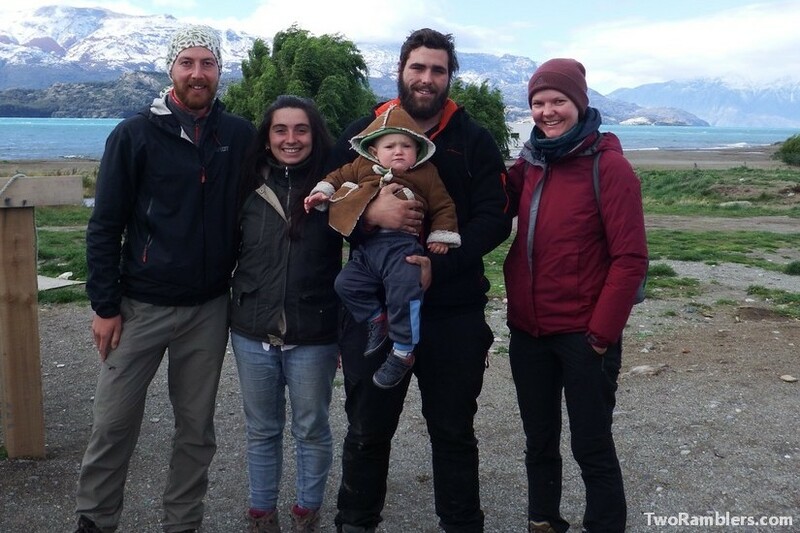 They were from a town not too far from El Chalten and had spent the weekend with walks in the National Park. When we reached the intersection with Ruta 40 the mother, sitting in the passenger seat gave us a little card of Saint San Expedito to protect us on our further travels. And she showed us the 20 cm statue of the saint that she always took along in her handbag. 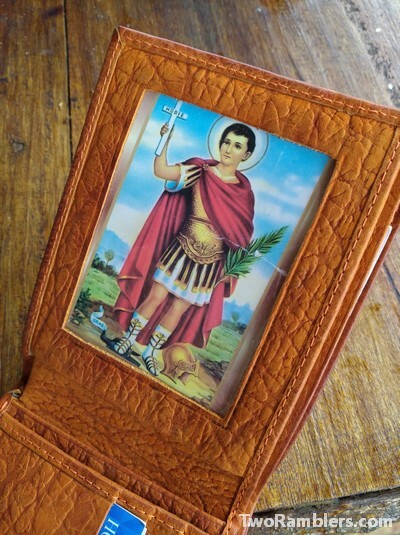 The card has been in Kevin’s purse ever since and Saint San Expedito has been doing his job very well. At the intersection three other hitchhikers were just having lunch. There was a German couple who were planning to go all the way to Canada and a French guy also on his way to El Bolson. We joined them for lunch but then spread out a bit, so it did not look like we all needed a ride together. First in line was the French guy. We waited for three hours and nothing happened. There was just no car going our way. The only ones that passed and stopped, asked for the way to El Chalten and then turned around. 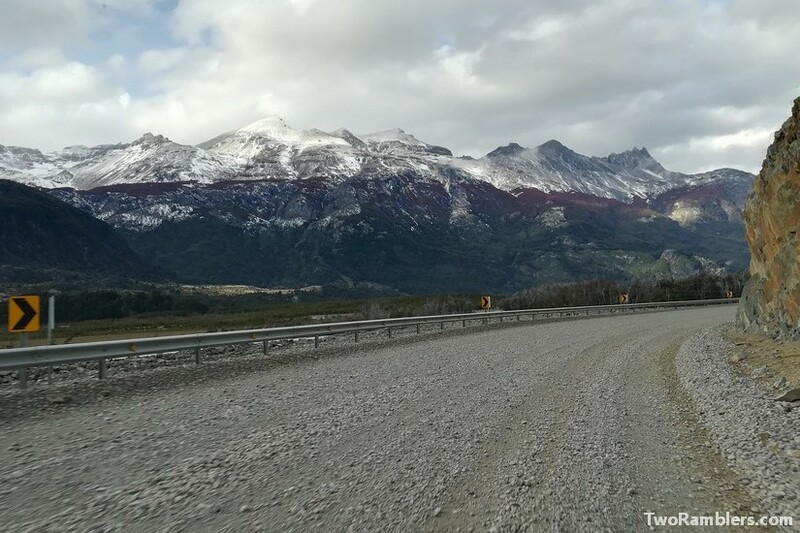 There was just no car going north from El Chalten. 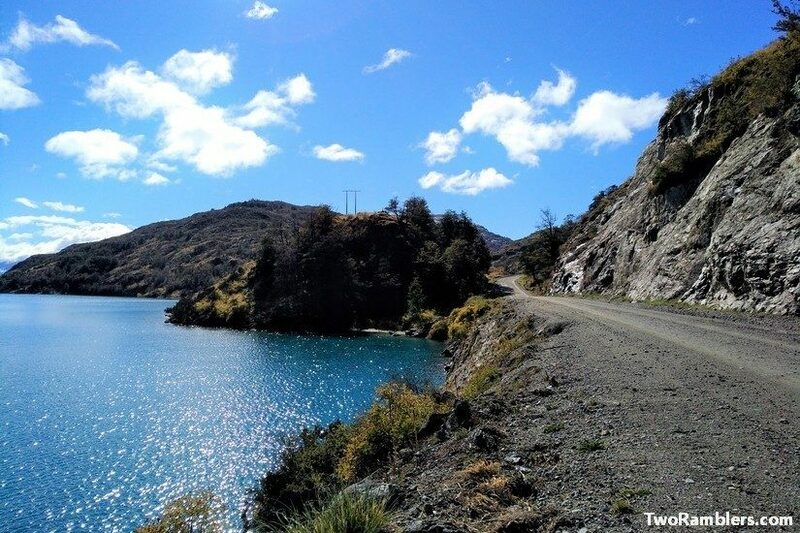 We had heard that there was another route to go north along the coast that was better maintained and more interesting to drive on rather than passing for many km through the Argentinian Pampa. Although seemingly a touristic attraction (we had seen souvenirs with road signs in all shops since Torres del Paine) Ruta 40 was not really used. Although the sun was out, it was very cold because of the wind. We took turns trying to find cover behind a big road sign but it did not do much. Another couple of hitchhikers, from Lithuania joined us. Despite the seemingly desperate situation, still no car had come our way, our mood was good. We talked about our hitchhiking and travel experiences, and jumped around to stay warm. Time passed surprisingly quickly but still at 5 pm nobody had been picked up. The French guy decided to head back to El Chalten to take a night bus to El Bolson. We considered to do the same but wanted to wait out a bit longer. An hour later and still no car had stopped. So we decided to go back to El Chalten as well. We knew that there was a night bus to the town Perito Moreno 600 km further north. From there we hoped it would be easier to get a ride. We crossed the road and started hitchhiking back to El Chalten. For the first half hour there were no cars in any direction and it was slowly getting dark. We were already considering putting up our tent beside the road when an American couple stopped for us. During the ride we were able to give them loads of recommendations on what to do in El Chalten and shared all the fun facts we had picked up. They dropped us off at the bus station and we spent the night on the bus. Despite being such an unsuccessful day, we were happy having met so many interesting and friendly people and our hopes were high for the next days. After our night on the bus we were ready to try our luck again. On the road leading north from Perito Moreno we met the French couple from the day before. Just like us, they didn’t manage to get a ride out of El Chalten and had taken the bus to Perito Moreno. Again, we had to wait our turn. We walked a bit further out of town hoping to catch some cars from one of the side roads. Luckily the wind was less strong than the day before. But traffic didn’t seem much better. Cars were either completely full with four persons and luggage or the drivers were signing to us that they were just driving around town. Then, there were a few elderly couples that did not even notice us. After three hours, a group of Argentinian girls arrived. They did their best to get the attention of the drivers, dancing and jumping around on the street but nobody stopped for them either. We agreed that we would wait until 5 pm and then go to the campsite in town. Ten minutes before five a car stopped. Inside was a women our age who had just come back from a day in Chile, hiking and kayaking and was looking for some company to keep here awake during the long drive home. Happily we got into the car. 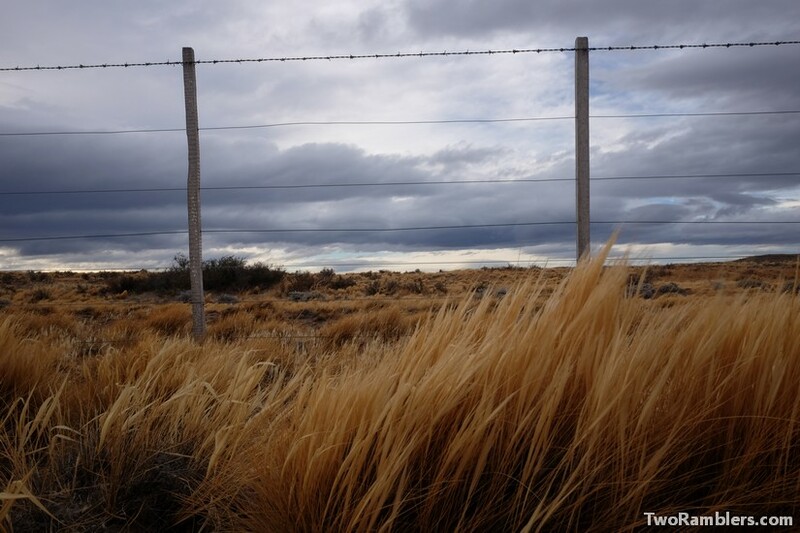 We drove for several hours through the Argentinian Pampa. It was like driving through whole of Belgium without seeing anything at all. No trees, no rivers, no mountains. Everything was flat, brownish, dry grassland with one road going through it. The only distraction were some guanacos and nandoos at the roadside. As we chatted in the car, Paula told us about her day in Chile. She had been in Puerto Rio Tranquilo where she had rented kayaks with some friends to visit the Cathedral de Marmol. She showed us some pictures of the day and suddenly Kevin paused. He searched some notes on his phones and there it was: he had noted the Cathedral de Marmol as a place he absolutely wanted to visit and we had completely forgotten about it. It was already late in the day, so there was no way to turn around and we had already made such a good distance on our way north. However, we were doubting about what to do. Paula dropped us off in Sermiento where we searched for a campsite. 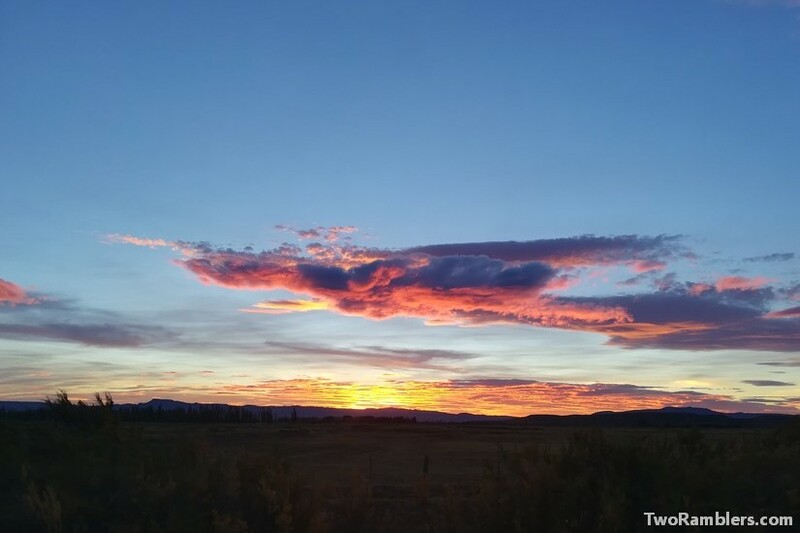 It was a very mild, actually warm evening. 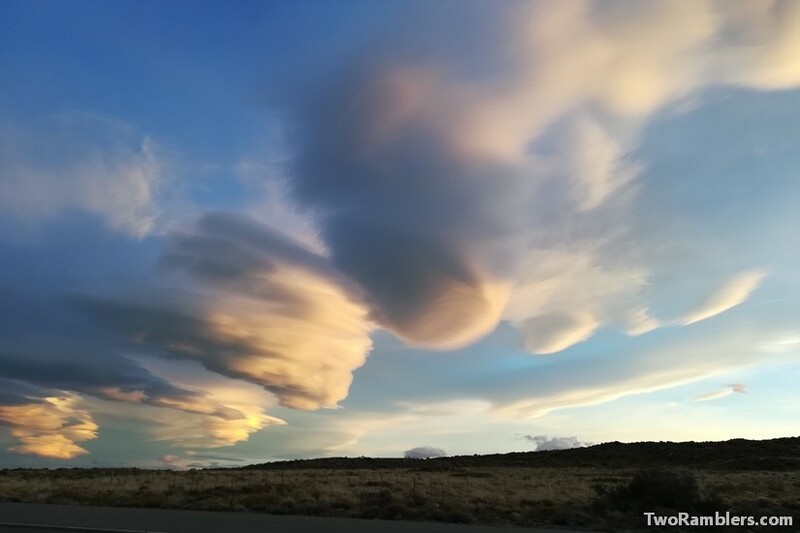 There was no more of the Patagonian wind. It felt like it was summer again. The town was very green, in strong contrast with the dry land we had seen all day. We watched a beautiful sunset and then went into our tent. We decided to let destiny decide about our destination. The next morning we would try to hitchhike again and take the first car either going north to El Bolson or back south to Perito Moreno to cross over the border to Chile. The next morning we met a German couple with their daughter on the campsite. They had rented a camper van in Bariloche and were on their way south. Anne and Jörg offered us a ride to Perito Moreno and so our decision was made. We drove all the way back through the Pampa to make our way to the Cathedral de Marmol. From Perito Moreno we managed to get a ride to Los Antiguos, at the border with Chile. 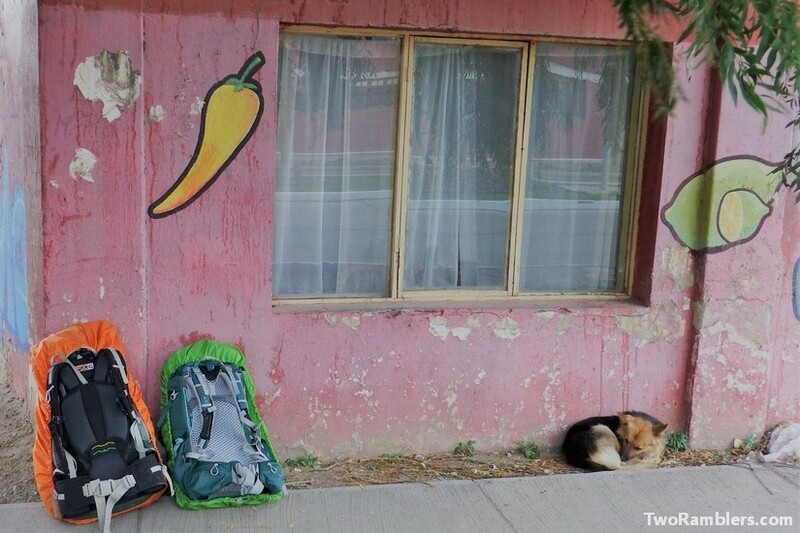 The next day we walked the 15 km over the border and spent a night in Chile Chico. From there it was only 160 km to get to Puerto Rio Tranquilo where we could visit the Cathedral de Marmol. It was raining in the morning when we packed up our tent and walked to the end of the small town Chile Chico. 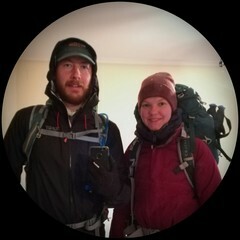 We found a big tree to leave our backpacks under and in our full rain gear started to stick out our thumbs. For once there were no other hitchhikers we had to queue behind. There was only a stray dog that ran barking behind every passing car and later lay under the tree beside our bags for shelter. We waited for a few hours without luck and started to doubt our plan. The weather forecast for the next days did not look too promising. Kayaking probably would not be possible. There was a bus going to Puerto Rio Tranquilo but it was rather expensive. We could also take a ferry to head north but then we would not see the Cathedral de Marmol and we had done all this effort to come this way. In the end, we just kept waiting. A Basque couple in a van stopped. They had driven all the way from Uruguay with their little baby in the car but were not sure where to head next. We did our best to advertise the Cathedral de Marmol, hoping that they would give us a ride. They agreed but wanted to spend the night in Chile Chico before continuing the next day. We decided to hitchhike a bit more, hoping to find a ride the same day. We stood the whole day in the cold rain but nobody else stopped for us. A couple from town came past a few times, always greeting us and then even offering their bathroom and some hot tea. As it got late they came to see us again and offered us to sleep in their house. Cold and tired we decided to give up and happily accepted the offer. They had a big house in the centre of town and we got a room for ourselves. It was a busy but happy mood in the house. Javier and Priscilla were busy making sushi that they sold in the village. They had a couchsurfer from Spain staying in another room. We were overwhelmed by their friendliness and hospitality. Suddenly we found ourselves on their couch with two delicious bowls of paste and veggies. We spent a very cozy evening with them, listening to rock songs from the 80ies and celebrating Priscilla’s birthday. We sang birthday songs in all languages and then fell into bed. The next morning the Basque couple picked us up. Their van had only two seats in the front. So two of us had to stand in the back of the car leaning against the bed. 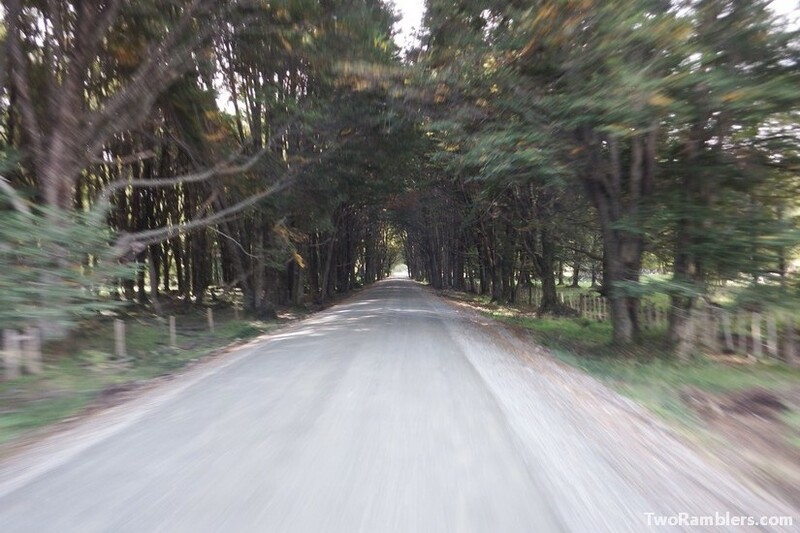 The route was a dirt road going along the coast line of Lago General Carrera. We had some stunning views over the lake surrounded by trees in autumn colours and snow capped mountains in the back but the ride was very bumpy and took much longer than we had expected. The last 50 km got very stressful. The arrow on the fuel gauge went lower and lower. Our driver tried his best to use as little gas as possible but his worries were written all over his face. We already prepared to walk the last km to get gas at the station in Puerto Rio Tranquilo but we reached the small town just in time. The couple still went on a boat trip out on the lake and we went off to search a place to spent the night. We found a very cozy little cabin and the next morning went to see the Cathedral de Marmol ourselves. It had been worth the detour and all the trouble. From Puerto Rio Tranquilo we went further north because we still wanted to get to El Bolson. We were very happy with our decision to cross the border to Chile. 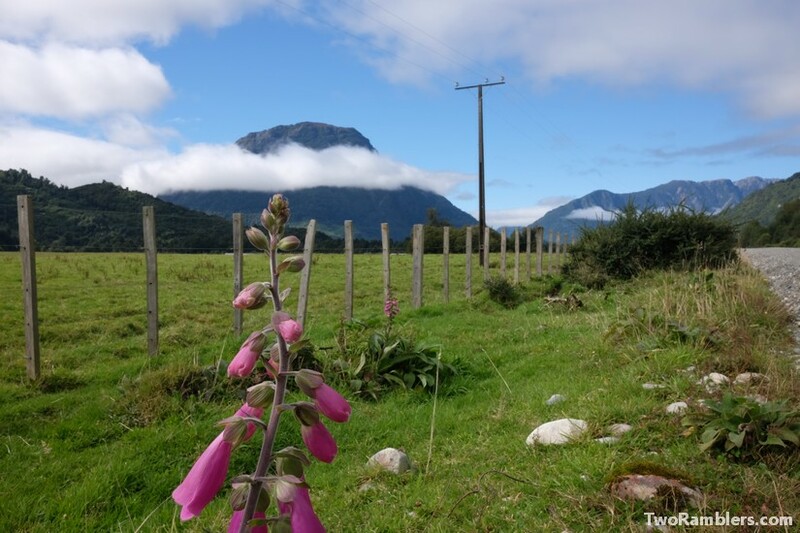 Compared to the Ruta 40 the Carretera Austral in Chile offered a lot more to see. We drove through mountain ranges, along rivers and lakes, always surrounded by trees. In Puerto Rio Tranquilo we had found a truck driver who took us along. He already had a guy from Venezuela on his passenger seat who was biking through South America. His bike was broken and in the back of the truck. We squeezed in between the two of them and together we went to Coyhaique. For three hours we drove along a dirt road full of potholes. Several times we had to stop because the road was closed for construction works. Big green signs announced each time that we might have to wait for 20 minutes. In the middle of the trip we stopped at a house and helped load the truck with nicely chopped firewood. Finally, we reached a paved road. We passed through Cerro Castillo. Here, we had considered hiking as well but we saw the snow capped mountains and new it was a good decision to keep moving north. We still got a beautiful view of the landscape in the evening sun. There were the snowy white tips of the mountains, below them a line of wine red trees. Further below the trees were orange and green. It was already dark when we reached Coyhaique. We stopped at the outskirts of the city to unload the wood and then were dropped off in the centre. We were not on our ease in this rather big town. It had been a while since we had seen so many cars and houses. The cold air was full of smoke from the many wood fires in the houses. Dogs were barking at us from every front yard. We walked around trying to find a place to sleep but the hostels were either fully booked or incredibly expensive. In the end, we found a cheap room with an old woman. She could barely hear us and the house was not exactly clean but it was okay for one night. The next morning we took a bus out of town. We wanted to leave as quickly as possible and didn’t feel like testing our luck with hitchhiking again. 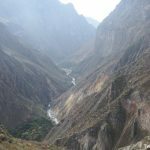 Our route continued to La Junta where we spent a sunny day at a lake and then continued with buses to Villa Santa Lucia and Futualefu. Then we crossed the border with Argentina again and spent a night in Esquel. It was another rainy day when we left Esquel. It is a rather big town so we had to walk a bit to find a good spot for hitchhiking. After a few days of travelling by bus we were ready to give hitchhiking another go. Very quickly a guy our age stopped for us. He was not going in the direction of El Bolson but brought us back to the Ruta 40 which we had left a good while ago and which would lead us to our destination. After the short ride it was time to get back out into the rain. Luckily there were some big pine trees under which we found cover from the wind and rain. Not many cars were coming our way. Several times there was a big truck on the road with a line of cars right behind. They were just taking over as they passed us. They would not stop for us. We slowly got discouraged standing in the cold rain when we heard a car horn. We turned around and saw that a car had stopped for us and we hadn’t even noticed. Inside were two joyful women in their fifties. Monica and Susana told us about their humanistic projects, their hikes, shared some mate with us and even served us lunch. They had packed quiche and homemade bread for their trip and shared them with us. We were already so happy to being out of the rain but this was perfect! They dropped us off at the tourist information in El Bolson and said bye with some wet kisses on our cheeks. Finally, we had reached the place to start another hike.